The school year has begun. Lucy’s in kindergarten in the morning and her favorite place — a school where the students spend most of their time outdoors, making up plays on the stage in the woods, or reading under trees, or creating games in the mud —in the afternoon. Suddenly, we’re all busy and on a rigid schedule again. Thankfully, Lu loves kindergarten. She comes home bursting to tell us stories of the kids who sit at the purple table with her, happy after art or music or PE class, but mostly she loves Wednesdays when they visit the library, because she’s so eager to read more and more. At least we know she’s well fed for these adventures. Lots of people have asked us what we feed Lucy for her school lunches. I’ll be writing a post about it soon. (Short answer? Plenty of protein and vegetables — like the sausage and peppers and cucumbers you see above — sometimes a sandwich— like the peanut butter and honey on pancakes sandwich you see above — and a bit of fruit, but no treats. Treats are for the afternoons or the weekends.) My first answer is always, however, what we give her food in. We’d like to introduce you to PlanetBox, our latest sponsors. They make great stainless steel lunch boxes, of all sizes, that make it easy to feed a gluten-free kid with a ravenous appetite for life who goes to school all day. We’ve owned this lunch box for Lucy for the past three years and it’s still holding up strong. She still loves decorating it with magnets. I love tucking a real napkin and silverware in the carrying case, along with a note for her every morning. This lunchbox is so durable that I’m almost certain it will carry her through elementary school, and perhaps beyond. I can’t imagine our life without this lunchbox. Honestly. Our friend Catherine McCord, who writes the delicious-for-kids site, Weelicious, introduced us to PlanetBox first. She posts photos of her kids’ lunches on Instagram almost every day. Her cookbook, Weelicious Lunches: Think Outside the Lunch Box with More Than 160 Happier Meals , is Lucy’s favorite cookbook of all time. So of course we had to get a PlanetBox for Lu. She has loved it ever since. We’ve asked Caroline Miros, one of the founders of this family-owned business, to tell her about what she does. Why did you start PlanetBox? When my oldest daughter turned 3, I started to look for safe, effective ways to send food with her to pre-school. I tried glass first, but after it shattered on the ground the preschool teacher politely asked me to not send such a safety hazard to school. I tried everything on the market, but was frustrated I couldn’t find an all in one lunchbox that was made of a safe material, and made it easy for my daughter to eat her foods. So I challenged my product designer husband to design something new with me. And here we are, 12 years later, with a line of high-quality, stainless steel lunch boxes at PlanetBox (yes, that means my oldest is now a teenager :-). Can you tell us about your newest products and how they meet a different need than your original lunch boxes? Our original design is the 5-compartment “Rover” lunchbox. It was designed for people who like smaller serving sizes and more variety – which describes most kids, and some adults. We then created the 3-compartment “Launch,” designed for larger serving sizes, and more bulky foods (think salads and large sandwiches). Then we expanded to the 2-compartment “Shuttle” last year – built for mini-meals and snacks on the go. We designed the Shuttle with little kids in mind, but have found they work great for teenagers (yes, back to that teenage daughter 🙂 and mini-meals on the go for any age. Can you share a story of a customer whose life has been helped by your product? Where do you see the future of kids’ lunches? I see more and more awareness about the need to pack healthy foods that work for you and your family, and I am so proud to be a part of that movement. I also see more and more awareness about the safety of the materials we use to pack food, and the amount of garbage and waste we create transporting our meals. We want to continue to be a leader in offering people safe, elegant solutions that function well, and make it easier to pack a healthy, waste-free meal on the go. We really believe in the work that Caroline and her company are doing with PlanetBox. We hope you’ll support them by buying lunch boxes for your kids! PlanetBox has kindly decided to give away two of the lunchbox kits. Leave a message here about what you feed your kids for lunch for the chance to win. Winners will be chosen at random next Monday, October 6th. I’d love one of these. They are spectacular and the individual containers often get lost at my house! Thanks! We feed our kid much like you (but we don’t have gluten intolerance to contend with). Great protein and lots of veggies, with a bit of fruit. I do love lunch boxes that are well designed and promote variety, so these look great! I also love the sound of Lucy’s school. We have 1 more year before kindergarten but really want to feel awesome about where our daughter will attend. My son just started preschool and I’ve been wanting something like this! What a great product! Wow, these lunch boxes look awesome! Our daughter tends to be a grazer like me, smaller amounts but a wider variety of foods, and presentation makes a big difference. I think adults as well as kids are more likely to try something when it looks appealing, right? I usually pack her a variety of raw or cooked veggies, some protein like a hard boiled egg or turkey ‘rollies’, maybe some cheese, and a piece of fruit. lunches for school have always been a challenge around here! This year peanut butter and honey sandwiches, frozen yogurt sticks and trail mixes are proving to be winners. Dried fruit and veggies with hummus are old favorites as well. I’ve admired these lunch boxes for a long time now! We feed plenty of protein, veggies and fruit. Although our three year old is on a pb&j kick right now, the one year old is more open to eating anything. We’ve been looking for something sturdy for preschool lunches…I think I’ve found it. My 9 year old doesn’t eat sandwiches of any kind, so we feed him a traditional protein/veggie meal for lunch. This would be great. No longer have kids at home, but I do pack a lunch for hubby every day: romaine lettuce “boats” with cheese and turkey, rice crackers, grapes, banana and a handful of mixed macadamia nuts, coconut flakes and dark chocolate. Wow! These look fantastic! My kids often get a salad and toppings for that, with some fruit and a dessert. Other times is crackers with meats and cheeses, and fruit and veggie and dessert. Sometimes it’s a creative sandwich (as they won’t eat a regular sandwich.) Always, though, I’m careful to have protein, carbs, veggies, fruits and dairy. The schools to which we send our children provide lunch. I’ve been working with my 6 year old on making good choices in the cafeteria. When everyone is home, we often have cheeses, yogurts, fruit, cut up veggies, almond butter, and bread. On the Sabbath, I try to have a hot lunch ready for us when we get home, often cholent which is a delicious dish of meats, bones, veggies, beans, rice, millet, quinoa, spices that I throw into the crock pot and let cook slowly for 15 hours or so. No kids but I try to pack my lunch most days during the week to take to work. I tend towards salads, protein, fruits, veggies, nuts. No treats here for lunch either. Treats are occasionally eaten on the weekend. These lunch boxes look amazing! We have a Shuttle for my kindergartner and absolutely love it. We would love to have another Planet Box for our other child. They are of such high quality and are so easy to clean. This looks life-changing! My children are also sandwich-averse. We pack 4-5 different items in their lunches each day. 1-2 proteins (my son eats cubes of garlic gouda daily), a salad or vegetable of some kind, fruit, yogurt, crackers/pretzels/popcorn. Treats show up occasionally in the form of a homemade sweet, a single triangle of Taza chocolate, or an adora calcium chocolate piece. We struggle to pack everything in reuseable containers and still have them fit in the lunch box. This would do the trick! We don’t have any kids, but this would be an awesome box for my Mom to bring her lunches in to work. My Mom is on a restricted diet because she has Lupus, and Parkinson’s, and just had a heart operation last month. But she still works part time five days a week. Usually I make food for her that will travel well and last a few days – roasted chickens and turkeys, hard boiled eggs, fresh fruits in grass-fed gelatin, roasted veggies, and paleo muffins and breads (pumpkin, zucchini, banana, and apple are favorites). The Planet Box Launch is so awesome that I’ll probably buy a complete kit for her for Christmas even if I don’t win. Thanks so much for featuring such a helpful product! What a great lunch box! I make four lunches everyday, with their help, but my kids always have all these little containers bouncin all over the lunch box, and we can never find all the lids lol. I love your product! We also struggle to put everything in reusable containers everyday. Lunch has always been a struggle for us but we try really hard to incorporate good foods into our boxes. This year, we’ve got lots of fruits and veggies going in along with at least one fun snack like veggie chips or Pirate’s Booty. I can’t resist the Pirate’s Booty myself! My oldest’s favorite lunch is fruit and yogurt with either cereal or pancakes. Second breakfast? 🙂 We’d love a PlanetBox kit! My son just started Kindergarten and is bringing lunch. He is gluten/dairy/soy/egg/corn and nut free but loves to eat! He also likes his all foods “separate” so this would be perfect for him! I would love to win one! We have been struggling to find the perfect reusable, portion controlled containers and this looks perfect! Have been coveting one of these for my 6yo for a while! I would love one of these for my kindergartener! It’s difficult to dfimd a lunchbox that can fit a variety of foods and isn’t conformed only to sandwiches. My son is a picky, gluten and dairy free kid. This may make things easier for everyone! My daughter is still in daycare, so she usually gets dinner leftovers for lunch. It could be pasta, steak salad, chicken, or anything else. Then she usually has cut fruit to go along with it. Right now we’re using plastic dishes that can be reheated, but pretty soon she’ll have to switch to cold food and that will be the challenge. We send leftovers for lunch. I love the smaller compartments to easily add veggies. Oh how I have coveted these! I pet them everytime I pass them in a store, and then ultimately talk myself out of them. I love the compartments and how pretty and balanced your meals can be in these! I would do a serious happy dance if you picked me! I’d even video it and send it to you! Haha! Thanks for posting on this. Your sweet kiddos don’t know how lucky they are to have you guys for parents. our 4 yr old’s lunch is usually a sandwich (pb + j, cream cheese + avocado), a fruit, a veg (peppers, cukes, cherry tomatoes, broccoli) and a small container of plain yogurt + frozen berries. Everything usually comes back empty! Since my son is in preschool, he still eats lunch at home. Our lunches usually consist of leftovers from dinner the night before. When he starts kindergarten and has to eat lunch at school, I’m not sure what I’ll pack! Most days, my 5yr old takes a sandwich, cheese stick, fresh fruit, dried fruit, cereal bar, and a treat to school along with a bottle of water. (He buys a chocolate milk at school, too.) He eats everything! This is exactly the type of lunch box I’ve been looking for! I usually just pack leftovers in mason jars, but that gets cumbersome and is breakable. I’ve been wanting a Planet Box for both my kids for years. They are awesome but too expensive to be able to buy two. I love this! I want one for ME! My son takes things like yogurt, hummus, cheese, and lots of fresh fruit and veggies! Occasionally he does take a sandwich, but mostly prefers the other foods. His school asks us to pack trash free lunches, which I think is great! I am obsessed with these, but have yet to buy one. I don’t have kids and don’t want one for my kid – I want one for me. I am tired of using 4 or 5 different zip top bags to put my lunch/snacks into. I toss them in my bag and everything gets smooshed on the bottom! I love the multiple compartments of this box! I’m a single gluten free mommy to 4 gluten free school aged kids. I have been searching for something like this to hold their lunches. We pack lots of smaller portioned items like yogurt, carrot sticks, cheese, rolled lunch meats, small salads, jimmy john style unwich subs, tuna with crackers or even tortilla chips and salsa. My kids hate traditional sandwiches even though we have a wonderful bakery nearby that makes fantastic gf bread so lunchboxes like these would be heaven sent!! I feed my kids dinner from the night before so it can range from soup to salad to rice and beans. But there are always a variety of veggies and fruits and snacks in there as well. We currently use so many little tupperware but this lunchbox seems to have solved that problem. I am wondering how leak proof it is, as that tends to be an issue we have noticed in our search for lunch related things. Planet box helps me to think outside the package of prepared foods. Today, in my older son’s Planetbox was chicken nuggets, mac n cheese, reapberries and a banana. He loves it and it makes life easy for me. My younger son is starting Kindergarten next year and I’ll be making 2 lunches. My kids love what we call snacky lunches. Cheese, crackers, ham, salami, cut veggies, fruit either fresh or dried and sometimes nuts. I’ve seen some great looking lunches on instagram packed into planet boxes. I’d love to win one! My neice is picky and likes to graze so when we pack her lunch it is always an assortment of proteins/fruits/veggies so having one box to separate them out in would be such a time saver for us! It would also save us from wasting so many Ziploc bags! Both of my boys have a peanut butter sandwich (every day per their choice), some type of fruit or veggie and some crackers or a cookie plus their water bottles. My older one especially is too busy talking to eat much more during their short lunch time. We already use reusable containers but this would be a great addition. My little one isn’t in school just yet, but these will be amazing when she is! I’m an itinerant art teacher, GF, often out of town for an entire day, and have to pack my lunch, snacks, and something to hold me over until I can get back home for a late dinner. This box is really streamlined and would fit in easily with my materials! Our kiddo is in daycare still, but he starts school soon. I love the idea of these boxes for helping me know portion sizes. I always want to fill my kiddo’s plate full, but i forget he doesn’t need that much. 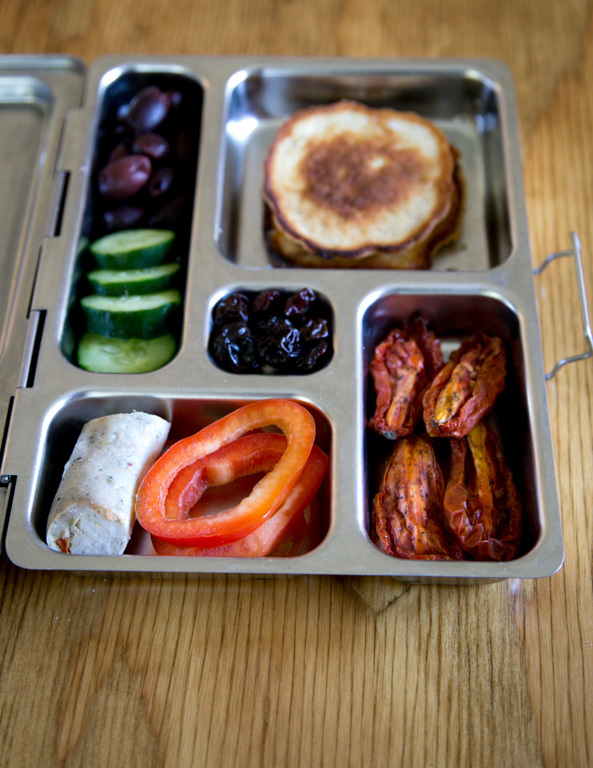 I use a divided plate at home for him, and a lunchbox like this would be awesome for school! I don’t have kids to feed but this would be great for me! We purchased the Shuttle Planet Box earlier for my gluten-free 2.5 yr old to take to his all day preschool and we love it! However, I am learning that he is a great eater at school and would LOVE to be able to give him a Rover instead but can’t justify the cost right now while my husband is growing a new business. If we were to win I would love to give away ours to another preschooler in his class that has a nut allergy – as it really is so GREAT to have a way to provide allergy friendly, healthy and eye pleasing meals for toddlers. Thanks for sharing such a great product with the world! We are Planet Box users for life! For lunch, my kids usually get the ol’ sandwich standby. BORING! I would love to get more creative with their lunches, and be able to control the portions of their snacks! My kids are usually given a combo of sandwiches, veggies, fruit, and other snack items in small quantities. They don’t adore lunch anymore because my own creativity has waned. I was just researching the planet box and other lunch box options to inspire me. What a serendipitous post! Our son’s community college schedule usually means he has to eat quickly, so packing food is essential. We also adhere to a protein, veggie, fruit combo, which varies. This would make it so much easier! My kiddo used to get hot lunches but recently switched to a school that does not reheat lunches for the kids. So we started using stainless steel bento boxes to pack her a variety of healthy foods in a balanced, economical and environmentally safe way. The challenge of filling each container with something nutritious has been great. Her favorite so far has been the “sushi” lunches which include a sushi roll, edamame, ginger chews and whatever else I can find! We have an 18 month old toddler who loves snacky lunches. Today it was cucumber slices and hummus, grapes, cut up cheese and a bit of homemade banana bread. One of my daughter’s schoolmates had one of these and I loved it! We try to stick to the simple protein/fruit/veggie lunch formula. They like a lot of variety, so these lunch boxes would be great. Wow, these look great! My oldest boy likes sandwiches, cheese and fruit in his packed lunch the best. My youngest boy has just started preschool and is very excited about bringing a snack with him to enjoy with his new friends and teachers. For his first snack he brought a homemade pickle! I usually send to school what we ate the night before for dinner. I use a Thermos container, it is great when I’m sending soup. Anything else I send in different sizes mason jars (talking about doing dishes here). Anyways, this looks awesome. I love to see conscious products like this. My mom, sister, and I are all gluten intolerant, but my sister has it the worst. She is in 5th grade now and has been taking a packed meal every day since kindergarten to prevent her from getting sick off of school food. She has become the most adventurous young eater I know because of it and loves having salads, fresh fruit, veggies with hummus, and the occasional turkey sandwich on Udi’s bread that’s packed with greens and some good cheese. She loves organic, grass fed turkey sticks too. Every once in awhile, she gets a treat, like one of my mom’s homemade cookies or brownies. She’s now at the age where the treats are occasionally made by her (with a little help from my mom, of course). I’ve been looking at these lunchboxes for awhile. I send my son to school often with peanut butter and jelly sandwiches since I know he’ll eat them. I want to send other foods but he is a picky eater and some days might not like the choice I made for him. I like these boxes because I can send multiple other items as well/instead of that he might actually eat without having to look for a zillion little tupperware containers to pack. My kiddo is only 8 months old, so he gets breastmilk. But I would love one of these! Seems like a great way to organize snacks and meals once he starts on solids. Thanks for the chance to win! Our standard lunch for our oldest includes a hard boiled egg and nuts or cheese. Lunch is just 15-min so I try to get nutrient dense bites in him. Some fruit, veggies & he’s set. The always-hungry 4yo gets two times as much food. He needs a traveling refrigerator. I’ve been eyeing these lunch boxes on Weelicious for the past 3 years. I wish my daughter could have one so much! I just can’t seem to justify the cost though. She’s such a picky eater. I usually pack the usual Peanut Butter and Jelly, simply because she’ll eat it. My “kiddo” is (allegedly) 53 years old, and when it comes to weekday away meals (in nis case, dinner) he might as well still be 10 years old. That meal is still the best time of his workday, and he looks forward to both the break and the yumminess. We send a lot of leftovers, jazzed up with some kind of crunchy element he can sprinkle on just before eating, and he likes finger foods he can pick from during his breaks, too. Dishes for lunch depend on what’s on tap, and we’d love something that’s dedicated to away meals so it’s always ready to go. Thanks for sponsoring the contest! Leftovers from a japanese dinner… Inari sushi (we call them “football sushi”), edamame, pan fried tempeh sticks with dipping sauce, and mini okonomiyaki pancakes. These are incredible! Thanks so much for sharing Planet Box with us! As for what I’d put inside it on its first outing, I think I’d go for hummus, veggie sticks, a cube of feta, and an assortment of olives and crackers. Yum! How nice to see a company who believes in making a product that lasts so long!! Like many, it’s not what I send a kid. It’s what I make for myself for work. Often that means leftovers + fruit. My work provides food for most, but it’s food I can’t eat all too often, so it’s just easier to always bring something, because I don’t know what I’ll be able to eat or if I’ll have time to run to some place close that has food I can eat. Given that I work for a company that is just starting up, I am hoping my parents take pity on those of us who work there and provide us with a microwave and toaster oven. Thanks to Shauna and the Chef, often I have been able to bring homemade pizza. I use the Weelicious cookbook to come up w ideas for my kiddos. They love picking out recipes and trying them! Gosh, my son’s been wanting one of these for the past two years!!! Winning one would be great! Oh this is timely! I’ve been looking at these for my son’s preschool meals. My 4 year old gets sandwiches with cheese and baba ganoush (mama win there) or pb&j, cheese cutouts, and fruit in his lunch each day. I also throw in a random other thing each day – sometimes it is special grahams, sometimes it is pretzels, it all depends on the day. I don’t have kids, but do pack my own lunches and/or snacks for work and lots of other occasions due to the lack of good, quick, healthy options out. I often pack leftovers from the previous nights dinner. I am currently in love with a paleo roasted pumpkin and garlic ‘hummus’ with either veggies or Mary’s crackers. Hard-boiled eggs. Nuts. Fruit. Apple gate Farms salami. Avocados. Kraut. Usually a protein, a fruit, a veggie, and some cheese. Sometimes leftovers from dinner if there are any. We try to mix it up, so a Planet box would be great; all of those little compartments are just asking to be filled with lots of variety! Would LOVE this kind of box–goes with the kinds of lunches we’ve been trying to pack lately!–lots of mini portions of things to encourage variety. Leftover pancake sandwiches with PB&J. Pasta shapes and cheese cubes. Peanut butter and pretzels. Cut-up pieces of plumcot and golden raspberries. Pumpkin seeds and dried cranberries. Paneer pakoras from Indian food takeout. This would work great for my son who loves fruit, cheese, crackers and rice rolls. That lunch looks lovely. My firstborn is in a mega picky toddler phase. I feed him whatever he will eat that minute. But we’re on a smoothie kick currently. My youngest is still momma feed. I like to prepack healthy snacks and foods for me the night before so I can still offer my kiddo something nourishing even if I’m mostly likely going to be eating it on my own. I have always been intrigued by these lunch containers; would love to try! Lots of fresh fruits and veggies for lunch in our house. Everything organic/non-GMO. Our daughter is in kindergarten also! She is picky and her tastes change from day to day so I like to pack her a teensy bit of everything so I know there will be something in there she will eat. This lunch box would be perfect for us will all of it’s cute little compartments. I would also feel good to get rid of all the snack baggies that we use. I have bought little containers for her but they often leak or pop open. We appreciate the chance to win one of these! My preschooler likes to try smaller amounts of various things. His favorite meal is antipasto: olives, hard cheese, salami, tomatoes, roasted chickpeas. I like providing the variety so there is always something he feels like eating. Packing lunch boxes is one of my hobbies , I love to plan ahead when I make my sons lunch boxes so that can fill those up with good , healthy and nutritious food.. I feel these would be perfect not only for kids but also for adults in a place like India where our meals comprise of various things put together on a thali.. I would love to pack a whole thali for my hubby or my son in such a lunch box. I can see sections for my vegetable, rice, roti , salad and a little container for curds .. a whole complete meal. I am very excited to get PlanetBox for our family, this is just what we need; Dad on the road traveling needs GF options for the long days; Mom needs the variety for snacks on the go; the little one needs to explore new flavors in smaller quantities…I see our family using the “Rover” “Launch” and “Shuttle” boxes for years to come. I’m very excited to have these options for our diverse family, thank you Miros family for a job well done! Oh man, I have been drooling over these lunch boxes for awhile now! Thanks for hosting a great giveaway! My daughter Nora is gf and I pack a lunch everyday- usually yogurt, fresh fruit and veggies, sunflower seeds and gf pretzels or crackers. Occasionally a sun butter and jam sandwich on gf bread, but that gets pricey very quick. These are great and would be used by myself for all the picnics I go on. I have no school age children, but I am still a child at heart! these are awesome. i don’t have kids but pack my own lunches–usually leftovers or salads–heavily plant based. I have been intrigued by these for a while. I am having a hard time justifying the cost. Glad that everyone that owns one, loves it so much! I worried about the cost when I first saw them too. But now that I’ve used this lunchbox for Lu every school day for 3 years, I see that it’s a long-term investment that saves money over time! My son eats great when I feed him good food – lots of veggies, fruit, protein; when mama’s lazy or hasn’t sufficiently stocked the pantry/fridge with the right stuff, then he’ll happily fill up on cheese, bread, pasta…. Looks like these cool lunch boxes are a good way to include lots of small portions of the good stuff. If it’s in front of him – he eats it! My daughter is really into soups these days. And we always have fruit too. We always cook extra amounts at supper time and that makes our delicious lunch the next day. We add fresh veggies from our garden. Our fall-bearing (Caroline)raspberries are abundant these days. They will travel well in the Planet Box. I am thrilled not to have to resort to glass or plastic and to have all the lunch in one easy to access “buffet” box. My (GF) daughter has been making her own lunches lately which means they are really simplified- Rice cakes and nutella with home-made fruit leather seems to be her go-to right now! I try my best to include a fruit, veg, protein, crunchy thing, and treat in each lunch. We don’t feed our kids wheat products, and we try to keep it interesting. My kids are 6 and 4 and I find that giving them lots of input encourages them to actually eat what I pack. Current favorites include melon balls (funny how a melon ball tastes SO MUCH BETTER than a melon cube or half-moon! ), homemade fruit leathers made using just pureed fruit and our dehydrator, salami & cheese cubes, and trail mix with chocolate chips. I have not invested in a planetbox yet (always wanted to but didn’t want to shell out the money, although I’m reconsidering based on such great reviews), but we have a wide range of bento boxes that my kids love at the moment! Right now I feed my son breastmilk, since he is 8 weeks old. Can’t wait to share the world of solid food with him and as a kindergarten teacher I really appreciate a well made lunch box! Does it count if I don’t have a kid to feed? My husband and I try to do food detox’s several times a year and buying lunch on the run just doesn’t cut it. I’ve been dragging around ten pounds of glass containers because I like to have lots of little tastes of things. This is incredible. I’m also happy to hear that it’s lasted over 3 years as it is a bit of an investment for a lunch bag, if a kid can keep it neat then I should be able to as well! Been coveting these for our three kids! My husband packs their lunches and it would be such a great gift to him to have a one piece box. Genius. My oldest boy just started Kindergarten… I pack him a cheese sandwich, some apples and bananas, crackers, edamame, cheese lollipops (that’s cubed cheese and toothpicks) and a tiny cookie as a treat. Preschool lunches include a sandwich and some fruit in our house. … and, I forgot to include the “what goes in it”. Kid 1: tortellini, peas, raw carrot, salami, chocolate. Always, unchanging, and forever. Nothing can touch. Seriously. Kid 2: anything from fried rice with veg + cheese + sausage, to beef stew from last night’s dinner, to spaghetti + meatballs. Plus oranges, apple sauce, kiwis, dried apricots (TJ’s Blenheims rock!). Kid 3: Still sorting out what works. Cheese always gets eaten; salami, too. Cheesy grits for the win. Veg always comes back home, untouched. Boo. Dried fruit + good yogurt: 50/50. Partly, I blame the 20 minutes they get for lunch, to travel to and from the cafeteria, unpack, eat, pack up, and go. At six, the power food gets eaten first! My son looks salami and cheese on a little skewer. His protein kebabs! And fruit, always a fruit. I don’t have children (I hope that’s okay), so I honestly want this lunchbox for myself: my lunches have kinda gotten out of hand, and they aren’t very well planned, and I think a Planetbox lunchbox would help me get them back on track in a fun way. My mom used to make me a pasta salad for my lunchboxes as a teen. She’d put cherry tomatoes, chopped zucchini and of course, feta cheese. She’d add poppy seeds to the dressing, which seemed so exciting to me. It was always a treat to open up my lunch and have a little container of that salad. That used to be my favourite lunch. She’d make it with corn pasta. It was yummy! I love to take GF pre-packed lunches or even dinner to my girls night with friends which usually involve scrapbooking til the wee small hours and then going out for breakfast. What fun! to have my own lunchbox! I am so excited I have been looking for a glass alternative for my rowdy and hungry boys. We travel with meals and snacks a lot but always struggle to pack them well and neat. I love these boxes!! My son loves a variety of food on his plate. He might get gluten free pasta with sauce, berries and veggies. But we don’t love the tastes if they all run into each other all the time, this would so solve that. This looks like a fantastic lunch box! We usually pack 3 things for my children’s lunch: sandwich or soup, fruit, and yogurt or something salty. We take our lunch every day — three of us — and these would be great! I’d love to not have to search for lids. My kids are really into their fruits and veggies. One is a lover of all things cheese and the other loves almost any meat. For both, they’re always something crunchy to go with the lunch.